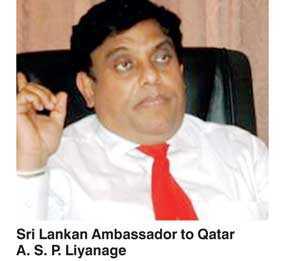 The Joint Opposition yesterday charged that the Sri Lankan Ambassador to Qatar A. S. P. Liyanage had wrested control of the Stafford Sri Lankan School in Doha, forcibly bringing it under the management of the Sri Lankan Embassy in an attempt to misappropriate funds to the tune of Rs. 4.5 million. Elaborating on the matter, Joint Opposition MP Wimal Weerawansa said that the school had been commenced by 20 Sri Lankans who had raised funds to set up the institute to ensure that children of Sri Lankan expat workers would receive the same education as the national curriculum. “There are 27 such schools there for Indian children. Stafford Sri Lankan School is the one and only school for Lankan expatriates there. Now the embassy has taken it over under its purview and created a mess. Lankan expatriates are lamenting this move. What is the Government doing to rectify this error?” MP Weerawansa demanded to know. He said that Ambassador Liyanage had taken over management of the school for the Rs. 4.5 million in funds. Deputy Minister of Commerce and Industry Buddhika Pathirana said that the unfortunate situation was a result of appointing an incompetent individual as a key diplomat. “An adjournment motion on the same issue will be moved in Parliament on Friday by UNP MP Asoka Priyantha and MP Weerawansa could expect a proper answer to his question then,” Deputy Minister Pathirana said. Meanwhile, Minister of Higher Education and Cultural Affairs Dr. Wijeyadasa Rajapakshe said that President Maithripala Sirisena had given directives on Tuesday, instructing Ambassador Liyanage not to interfere with or obstruct the functions of the Stafford Sri Lankan School in Doha. “The President ordered the Ambassador to allow the continuation of work in the school without any interruption, and that he will negotiate and settle the other pertaining matters. The Ambassador promised the President he would run the school in a manner that does not affect the children,” Minister Rajapakshe said, adding that the President had intervened following complaints made by Sri Lankan expatriates in Qatar.